This is the first of two Bloomsday t-shirts I made with a friend, but unfortunately for a sad reason. Her sister-in-law ran Bloomsday every year for years - first with her father, then with her husband...until she passed away last summer from brain cancer. In her mid-30s. Which, I'm pretty sure the reason my friend hasn't named the quilt yet is because she's considering "F%$@ CANCER" as a name. 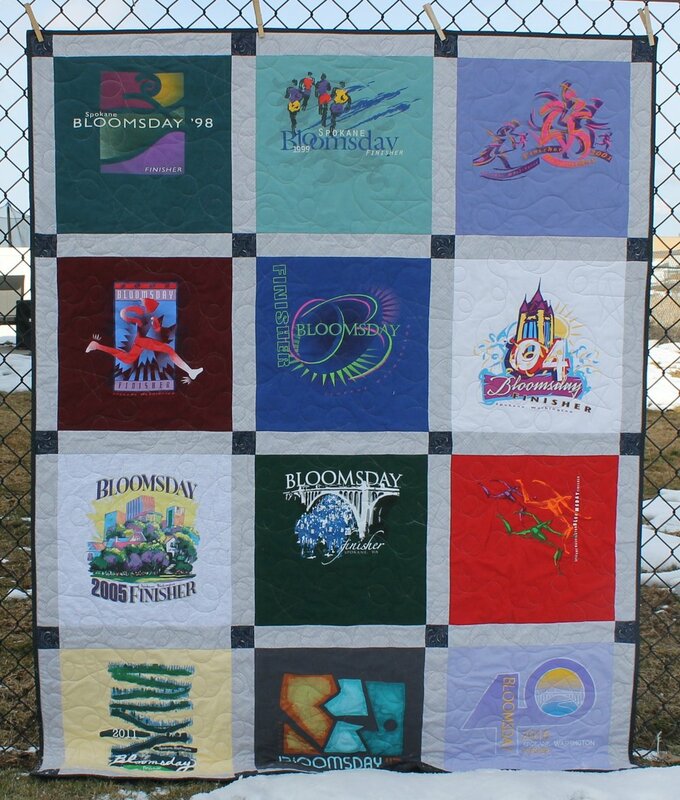 This one is for her sister-in-law's father, and contains the earliest Bloomsday shirts, plus some duplicates from the 2000s. We decided to lay it out in chronological order. The backing is from Joann's - my friend picked it because it reminded her of fireworks, which her SIL loved, and because grey is the official "color" of brain cancer. It will tie together with the next quilt, since we used the same fabric for the border. The binding is also from Joann's. The grid fabric is Architextures Crosshatch in the long pieces, and a Civil War repo in the small squares. Because I like mixing things up.